We had some 3 hours to spare on a cool Friday morning so we decided to head down to Pasir Ris Mangrove Boardwalk. We only managed to walk a small section of it the last time we visited Gallop Stable. We hoped to be able to finish the whole trail this time, if the weather, and of course, the children, permit. The Mangrove Boardwalk is a short 3 minutes walk from the Pasir Ris Carpark C. It is nearer the entrance of the carpark so do avoid parking all the way at the end. The other end is nearer Gallop Stable. 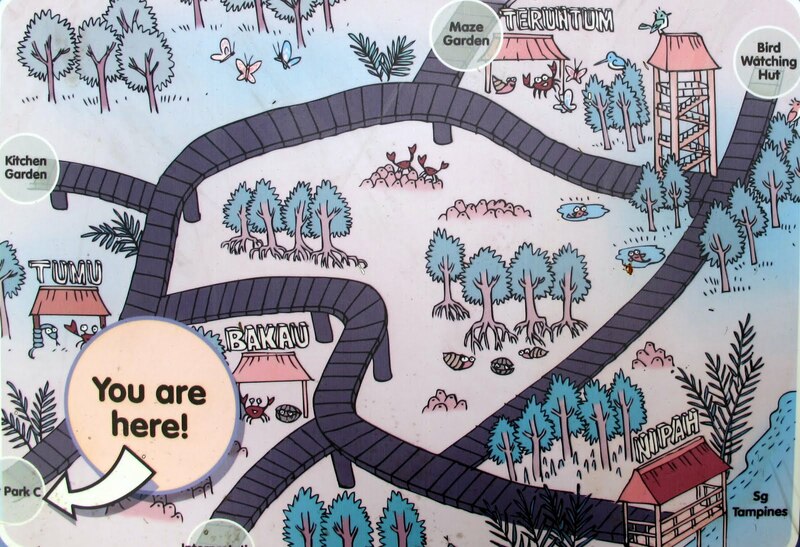 There are a total of 4 entrances and the one with 'You are here' is the nearest to the carpark. There are several sheltered huts so we took the opportunity to rest our legs when we saw one. A asked a lot of questions as it was an eye-opener for her. The trees in the mangrove trail are different from what she usually sees. I had to explain characteristics like prop roots and aerial roots and their purposes. Even if you do not know much about the mangrove, there are information panels scattered along the trail. The information is very comprehensive and the colorful illustrations made it very interesting too. A would stop at every panel and have us explain it to her. K, on the other hand, was just happy with staring at the animals and insects along the way. At one end of the trail is a 3 storey birdwatching hut. From there, we saw Sungei Tampines. Everything around us looked so tranquil. Definitely a place where I can sit and reflect. On the way out from one of the entrances/exits, we saw a gardener tending to the Herb and Spice Garden. It was a good opportunity for the kids to see how a gardener works. The gardener worked hard under the sun, moving huge heaps of soil in a wheelbarrow. We took the chance to explain to the girls the importance of caring for the environment. There are people who have worked hard to take care of the beautiful environment. We need to do our part to care for them too. Definitely a learning moment. Interestingly, we saw some compost barrels. Dead leaves are left to decompose inside the barrels. This would in turn be used on the garden. Very eco-friendly indeed. - Things that a plant needs for growth, e.g. water, sunlight. We saw some creepers in the mangrove vegetation and explained to Anna the plant's need to grow tall in search for sunlight. Concept of how sunlight is vital in the food -making process can also be explained. - Concept of decomposition, e.g. how it happens and why it is important for the environment.